Pacha Manga Curry / Raw Mango Curry | Simple and Delicious ! Another simple recipe to try out during this mango season! 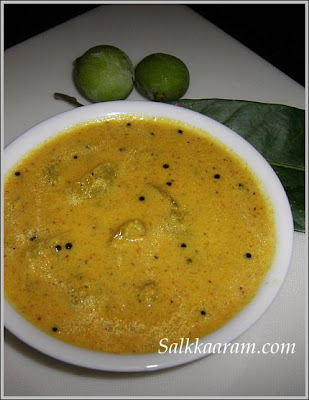 This will taste better if you prepare it with some "moovandan mangoes"..And small mangoes / kanni manga are very good for this. Cook mango pieces with enough water, chilly powder, turmeric powder and salt. Blend coconut in water to make a fine solution. This must be enough thick. When the mango pieces are cooked, pour the blended solution into this. When it begings to boil, remove from fire. Don't allow to boil for long. Heat little coconut oil, allow mustard seeds to splutter, add curry leaves. pour this into the curry. Hi Seena, Mango curry is new to me. Sounds yum. da,ippozhum mangayaano ? drooling..pinne last postil njan thante 'puttu' lekku oru link koduthirunnu. wow! looks yummy n delicious! Microwave oven series is going on! join with us in the EFM-Microwave Oven Series! Youknow i am droolng ehre this is one of my fav curry.. Delicious curry seena,those mangoes looks so cute,brings back the memories of the mango tree in our back yard . The curry looks so good! Now I see the comments! YAY! Enikku sukham thanne, might plan an India trip this year. I came and return with ur comment section closed :( Don't do that, we can understand ! R u in mango mood! Sounds another delish dish Seena. slurrp....pacha manga curry with paraboiled rice and pickle.would be a terrific combo!! is this curry made with pacha manga? i will have to try it out... I have got a lot of pacha manga lying in my fridge not being able to find many recipes to put them into use. 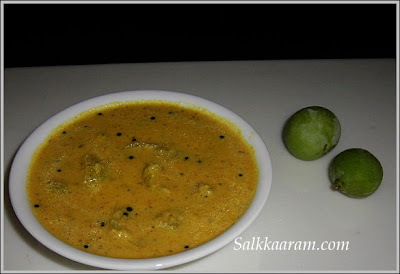 Actually this is a V.good curry easy to make, but most of the time I can't cook like mom do.. Whenever she makes this, I am the one, who finish it.. Prepared the mango curry yesterday. First reaction was , wow this is so simple! And since this is my first time and first time is sometimes pain, the amount of coconut paste and mangoes was more and hence a lil bit sour. But the taste was awsome and in his words "this is the real nadan kerala taste" and I just blushed! :) thanks to you!